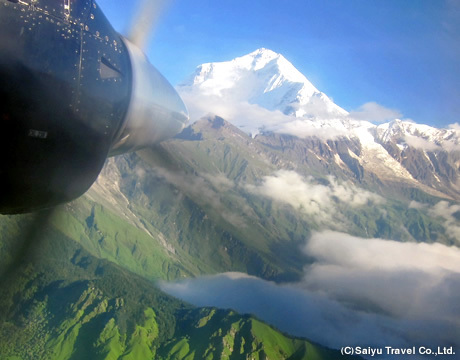 Domestic Nepal Air Ticket｜Saiyu Nepal Trekking & Expedition Pvt.Ltd. [Best prices] We could arrange the air tickets of domestic Nepal. Please enquire us the flight routes are not listed on the tariff. Many domestic flights in Nepal provide the splendid mountain sceneries for the Himalayas in altitude 7,000 to 8,000 m, if the weather is fine. On the contrary, if the weather is not good, the flight may be cancelled due to visual flying. Specially the routes Kathmandu ⇔ Lukla and Pokhara ⇔ Jomsom are easily affected by the weather conditions. If you fly on those routes, we recommend you to plan your tour schedule is counted in a sufficient time. ※Cancellation Policy may be changed by an airline company without a prior notice. Please confirm the newest conditions when you apply. ※The airfare for the children 12 year old (on the boarding day) and younger may be applicable. Please enquire us. ※The air fare price is included the airport taxes. ※Changing the reservation (booking) before an air ticket is issued can be accepted on free. However, no seat on the flight you want to board may happen, so please understand on it beforehand. 1 After all data is input on flight dates, times, names (as the same spelling of names stated on passports), please reserve (book) by email. After a reservation is finished, we will send you a bill by email at the same time the flight name and time are informed. ※We could accept your payments by US$, Nepal Rs and a credit card. 3 After the payment is confirmed, the air tickets are issued (bought) and sent you be attached by email. ※The guide will handle all procedures for the person (client) who ordered the car and driver services to and from the airport. Change to the flight on next day At the airline counter, please inform a clerk the flight to be changed on the next day. On the issued ticket, the day and flight name are overwritten. You can change the flight on a couple of days ahead. If you will cancel you flight reservation, you bring the ticket to the airline counter in the airport and make a clerk stamp the flight cancellation on the ticket. Please call or visit SAIYU Nepal office to inform the cancellation and make them reimburse the air fares. ※At the airline counter, it cannot be finished the reimbursement procedure, so please contact us. Cancellation by 17:00 on two days before the flight day: The amount of proper air fares deducted 10% and handling charge US$15 is reimbursed. Cancellation by 17:00 on one day before the flight day:The amount of proper air fares deducted 33.33% and handling charge US$15 is reimbursed. ※Flight cancellation due to airline company and / or weather condition, the amount of proper air fares deducted the handling charge US$15is reimbursed.